Search and rescue operations were underway off the Japanese coast early Thursday local time after a Marine Corps C-130 and F/A-18 fighter jet crashed, and so far one Marine has been rescued, military officials said in a news release. The rescued Marine is being evaluated by medical personnel at Marine Corps Air Station Iwakuni, Japan, while the search continues for the remaining six Marines involved in the crash. The mishap occurred at about 2 a.m. local time Thursday, after the aircraft had taken off from Marine Corps Air Station Iwakuni to conduct regularly scheduled training. Japanese search and rescue aircraft were aiding in the recovery, according to a Marine Corps statement. 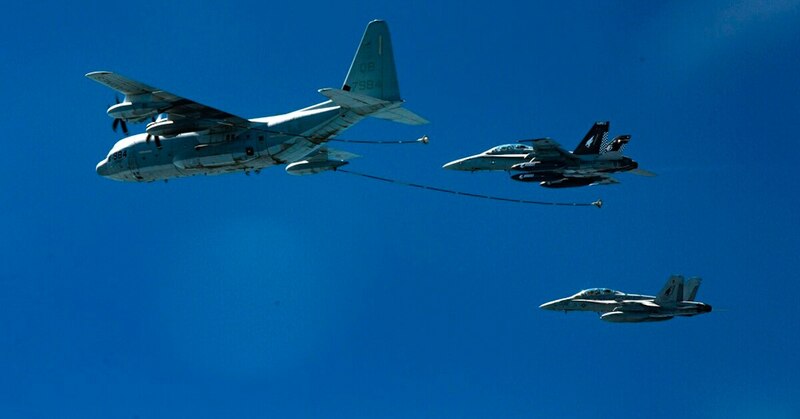 While the exact aircraft involved were not immediately released, Marine Aerial Refueler Squadron 152 flies the KC-130J out of Iwakuni and several fighter squadrons are based there as well, according to the command’s website. USNI reporting its a F-18D from 242 sqn and a KC-130J from 152 sqn. The 130J loss will be keenly felt. There is already a 25 KC-130 shortfall that is partially filled by the use of the 130T in the reserve sqn. Prior to this the 130 has a stellar safety record with only 3 class A mishaps from as far back as 1980. The last being the 130T accident in July 2017 and the other 2 occurring in 2002. VMFA-242, MAG-12, USMC, based at MCAS Iwakuni, Yamaguchi Prefecture. VMGR-152, MAG-12, USMC, based at MCAS Iwakuni, Yamaguchi Prefecture. 1:40, during training, collided, and crashed into sea, 100 km south-southeast from Muroto Cape, Kouchi Prefecture. 5:40, one F/A-18 pilot rescued by JMSDF SH-60. 10:45, one pilot or crew found by JCG patrol ship. 12:15, rescued by JMSDF training ship. F/A-18 was one of flight of at least two. VMFA(AW)-242 "Bats", MAG-12, 1st MAW, USMC, based at MCAS Iwakuni, Yamaguchi Prefecture. VMGR-152 "Sumos", MAG-12, 1st MAW, USMC, based at MCAS Iwakuni, Yamaguchi Prefecture. F/A-18: two crew ejected, and rescued. Captain Jahmar F. Resilard (28). KC-130: five crew missing as at 2018/12/08. 5:40, F/A-18 co-pilot rescued by JMSDF SH-60J, and was conscious. SH-60J of 24th Koukuutai, JMSDF, based at Komatsushima AB, Tokushima Prefecture. SH-60J delivered F/A-18 co-pilot to Komatsushima AB, and another SH-60J of 24th Koukuutai delivered F/A-18 co-pilot to MCAS Iwakuni. 10:45, F/A-18 pilot found by JCG patrol ship. He was strapped to his seat. 12:15, rescued by JMSDF training ship, DD-131 JDS Setoyuki. SH-60J of 24th Koukuutai, JMSDF, delivered him from JDS Setoyuki to Komatsushima AB, and to Tokushima Red Cross Hospital, Komatsushima City, Tokushima Prefecture. 23:00, F/A-18 pilot confirmed as killed, at Tokushima Red Cross Hospital. SAR action included patrol ship PS-15 Bizan of Tokushima Coast Guard Office, JCG. Tokushima Coast Guard Office, JCG. Last edited by Gamera on 08 Dec 2018, 14:51, edited 2 times in total. Thank you for the detailed information, it's highly appreciated. The search has been ended and the missing declared deceased. Sad to read this. Condolences to the families and friends. Pilot: Major [posthumous Lieutenant Colonel] Kevin Herrmann (38). Wife, three daughters (12, 10, 7). Staff Sergeant Maximo Alexander Flores [Junior] (27). Corporal William Carter Ross (21). Three distinct signals thought to be from the flight data recorders from a Marine Corps KC-130J and F/A-18D that crashed off the coast of Japan last month have been detected, the Marine Corps confirmed Sunday. Five crew from a KC-130J assigned to Marine Aerial Refueler Transport Squadron 152, 1st Marine Aircraft Wing, or “Sumos” squadron, and the pilot of the two-person F/A-18D Hornet assigned to Marine All Weather Fighter Attack Squadron 242, or “Bats,” were killed Dec. 6 in an accident over the Philippine Sea that has been described by Japanese defense officials as a midair collision. The investigation into what caused the crash is expected to take months, the Marine Corps previously said.